.. The word is out: fish the Gallatin River. .. Saturday was a perfect day! There was a cool morning with low overcast. Then a bright midday with high overcast. By 6:00 P.M. the clouds thickened and the temperature dropped. 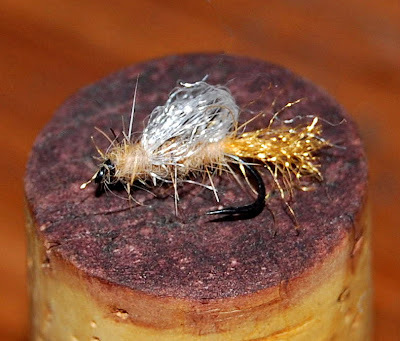 .. Little bugs in the morning, hoppers through the midday doldrums, and caddis in the evening. All this was spiced up by ants, beetles, spruce moths, damsel & dragonflies, and exotic license plates. .. The parking areas at Bighorn, Fan Creek, and even Bacon Rind, were occupied. Not full, mind you, but "with car." 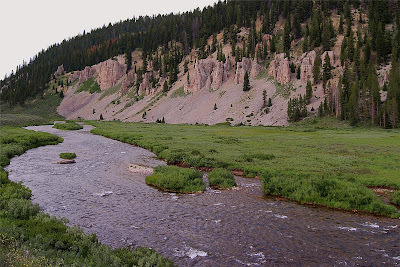 .. Pull-outs were filled throughout the park section of the Gallatin River. Some Condominiums with wheels were parked in the narrow sections and caused a slowdown in the afternoon leapfrogging from hole to hole. .. Mostly the neighbors decided that this was the day - and was it! The fish noses were in the air all day. .. They attacked twigs, foam, leaves, biologicals, and artificials with abandon. It was not quite a popcorn frenzy but the action was satisfyingly brisk. .. After our recent outing to the mosquito infested jungle of the S.W. 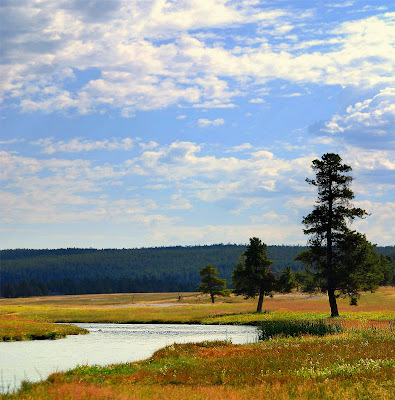 corner of Yellowstone National Park, it was pure joy to fish where a gentle breeze kept the mosquitoes at bay. And, thankfully, a breeze gentle enough so that casting was pleasant. .. We're counting on the weather gods and a bit of voodoo to bring us another day just like it was yesterday. .. Yellow and gold and amber have crept into the vegetation color palette. .. Things are drying and dying. The lichen has lasted longer this year than most years: it too is beginning it's Fall recession. .. We've eaten our second helping of spuds, a full pound of bacon, three eggs in an omelet with ham and cheese, and finished our second pot of coffee. That might get us out the door. .. Off we go to do battle with little bits of water that are known to all and fished by none. We'll return with a report similar to this - Amphritite willing. .. Now for a second, albeit it smaller, breakfast and a wee bit more coffee; just for drill. .. We heard the rumors. We drove over to see. The river is beautiful. Catching sucked. It's Early But . . .
.. A nice 22" buck Rainbow Trout was taken on a worm at the Duck Creek Highway 191 Culvert Pool yesterday. It was bright, feisty, and very colorful. It was cooked on a grill in foil with lemon, sage, and bacon grease - the flesh was on the pinkish side. .. Bigger fish were not landed, and several were seen jumping up the little water fall debauching from the corrugated pipe. .. Reports from the worm-tubers around the Grayling Creek Estuary highlight the catch of fish of the same class. Gulper fishers continue to comment on the bright fish of good size taken from the narrows up to the mouth of the river on the Madison Arm of Hebgen Lake. .. So we quickly dug out the "big & ugly" boxes and took inventory. 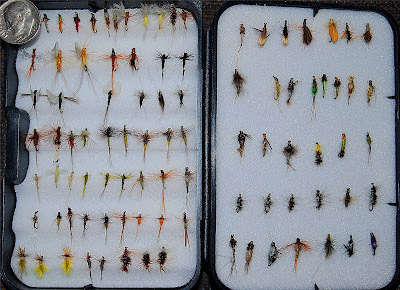 The streamer stash was also examined for completeness and diversity. The mouse collection was scrutinized for possible additions. .. It's not quite time to expect the submarines in any number - but the anticipation of the fleet is always good for the visceral juices. .. We mention this now, (while the fishing is still just a bit on the easy side,) so that the best excuse for a stint at the bench will be foremost in the cerebrum. Just in case anyone asks. .. We've been chastised for using flies of heroic proportions and weight. We admit it and the excuse easily rolls from our lips: old eyes. .. For those of you with eyes better than bifocals, here is one fisher's go-to-box for the quiet, gentle, smooth water that abounds in the mornings this time of year. .. She tied them all and told us most of the names. We forgot: old synapses. .. 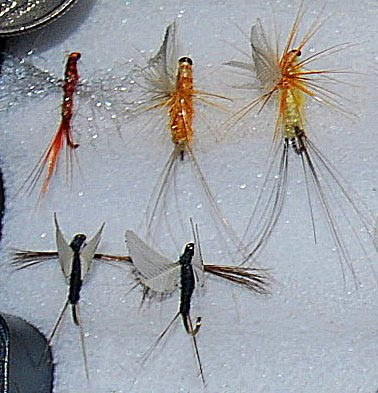 There were 100 in the box but a few went the way of trout too big for the tippet. There's still over $200/retail in that little box. .. The trailhead parking lot at Lone Star is full of cars, the Kepler Cascade parking lot is full of cars: "What to do?" .. Fish the little sister. There's plenty of parking. 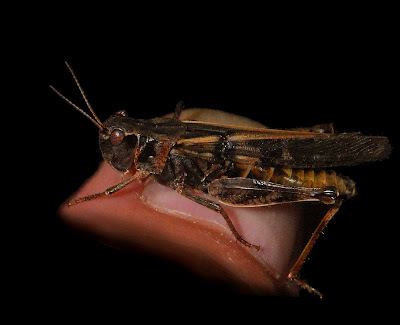 There's lots of hoppers. There's cool deep runs. There's few fishers. 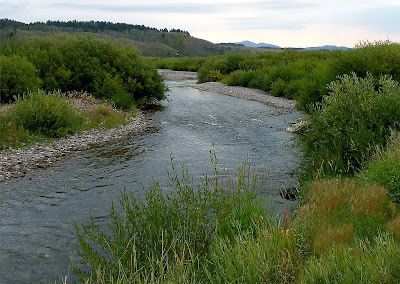 Nez Perce Creek is fishing well, and the catching couldn't be better. .. The walk to the fishable sections is pleasant and of a gentle grade. The trail is discernible but not well worn. With morning clouds the dew will wet your socks until 10:30 or 11:00 AM. 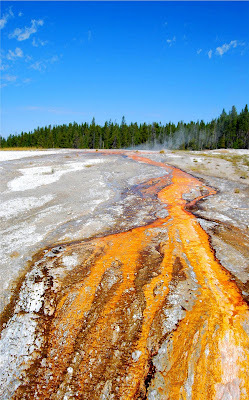 .. Take pictures, but stay clear of the thermal areas. When you get in the vicinity of the first bridge you're home free. 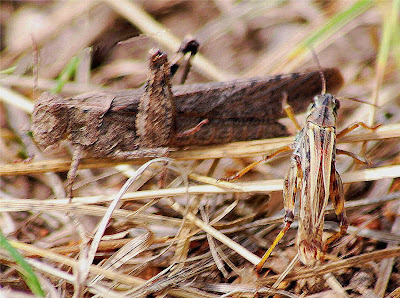 The heat has not slowed the catching and the hoppers are in full flight. 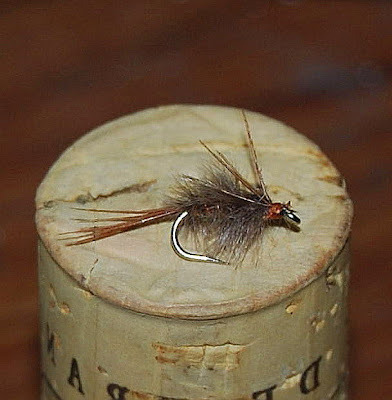 .. Take as many or as few types of flies as you like. The fish are feeding and enjoying a feast of both terrestrials and aquatics. .. Hoppers are prime attractors: so too, Beetles, Ants, Mosquitoes, Spruce Moths, and of course your favorite Wulff. The action on top is consistent and nearly continuous throughout the day. If you see noses, fling 'em some food. 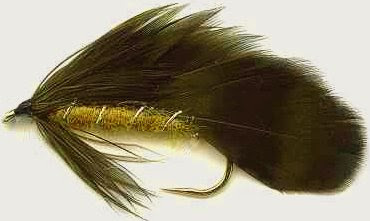 .. Subsurface fishers can find plenty of action by drowning the above flies or sticking with the favorites: Prince Nymph, Muddler Minnow, Hornberg, and Feather Duster are the usual neighborhood choices. .. 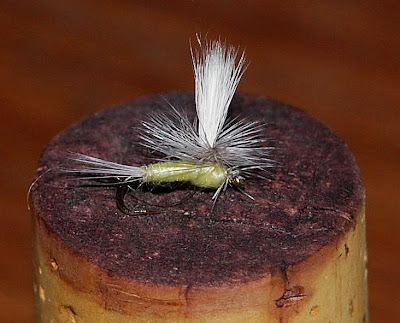 There is still a fairly decent caddis hatch on Nez Perce Creek. 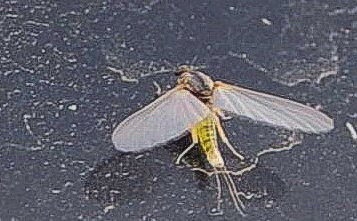 There is also some sporadic mayfly activity. If you bump into one of these - have at it. .. A few enormous bison are wandering in the meadows and a sharp eye should be kept peeled during this time of year. It won't harm your day if you leave the trail and retreat to the trees as you watch these fuzzy giants amble by. .. The unsettled weather for the upcoming 10 days or so should keep the fish and the bugs percolating right along. Hot for hoppers and ants, cloudy & cool for mayflies, sunny for moths and caddis: what more is there. .. It's easier to justify getting up earlier when the sun gets up later. Each cloudy morning brings the last of the mayflies to the surface. They are small, (16 - 20,) and not as sparse as the skeptics would have you believe. .. The neighbors love these mornings. The slick sections of the Madison River along the park boundary are dimpled with noses. The head hunters are in the northeast section of the park. The fish counters are having a second cup of coffee and are waiting for the caddis on the Gallatin River. .. 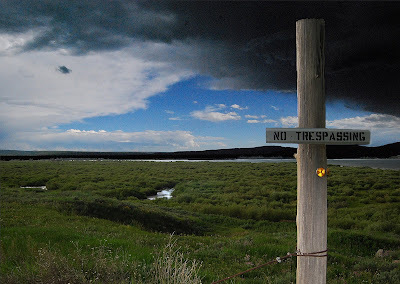 The Madison River is not abandoned, but the elbows are rare. The fish food is diverse and the trout can ignore some offerings and chase others. .. Yesterday morning they were ignoring spruce moths in favor of little green flies. There is just no accounting for the preferences of trout. .. Clouds of ravenous mosquitoes accompanied fisher folks on their Sunday, (sundry?) wadings. It's a small compensation to know that they are trout food! .. Twitches induced by the little blood suckers can certainly ruin a drift in the glassy waters of a Madison morning. .. As the river cools the action will pick up and the density of fishers will follow. 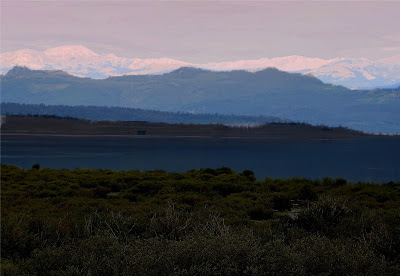 The large fish are already staging in the willow darkened estuaries of the small tributaries to Hebgen Lake. 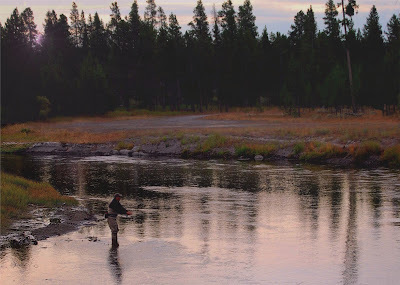 A few early runners have been reported in the Madison River; but they weren't taken on size 18's. .. Speaking of Hebgen Lake; gulpers are gulping. Catching on the surface is excellent until the breeze begins to blow. The fish are still gulping but it's nearly impossible to see their noses and cast to them when the wind picks up. .. Some sizable fish, (to 20",) have been taken on local callibaetis imitations. We use a feather duster with a wood duck flank tied like a soft hackle - works just fine. Can Fall Be Far Behind ?? .. 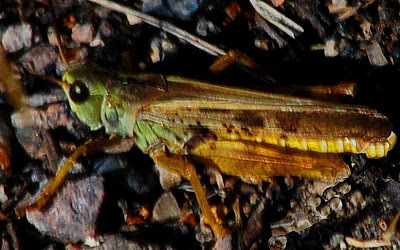 Hot weather has activated the hoppers on the Gallatin River, (and others of course.) 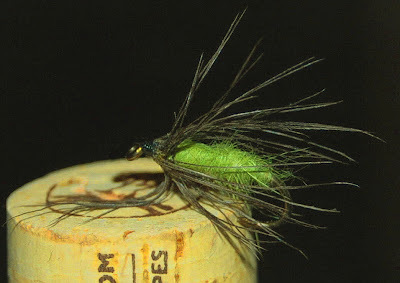 Right now fly choice is seemingly simple: 'heave a hopper.' That's fine. .. The challenging decision is: 'what dropper?' 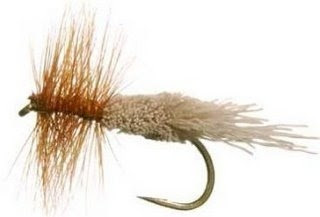 We see more soft hackles as droppers this time of year than any other fly. .. The choice is personal and can lead to exuberant discussions. 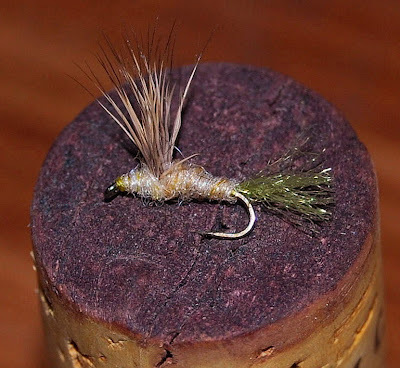 We keep it simple: caddis green angora and partridge rump. Pick your own poison. .. 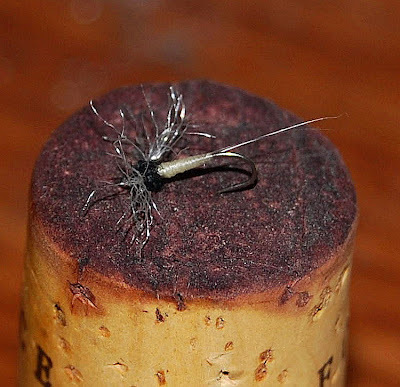 Periodically we torture ourselves with the exercise of tying on a small fly in the windy Gallatin River Valley. .. The apparent humor of it all escapes us: it entertains our neighbors no end. .. So we played the masochist and spent a whole day on the Gallatin River and fished with a few of the neighbors and their flies. .. 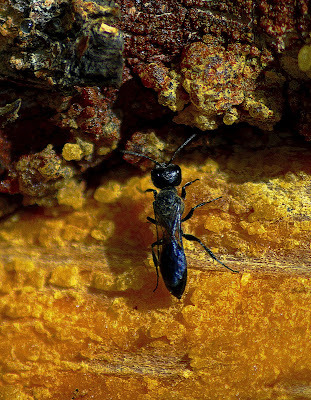 These little flies probably have fancy names: we weren't told. They were generously given to us and came from the experimental vise of a person with eyes that work. His advice was to: "Put 'em in the glass and let the fish do the work." .. Simply translated: 'since you can cast but can't see - don't tug until the fish does!' So we cast to the heads of big and little slicks, and it was just that way. We caught about a dozen fish on the little flies, (16 - 20,) and didn't see a single take. Even a 14" Brown Trout sucked one in with no visible evidence. .. Now then, for mastering the art of tying a knot in an invisible tippet - that should be a hoot! .. The Gallatin River fish are beginning their glutenous Fall Feast. .. 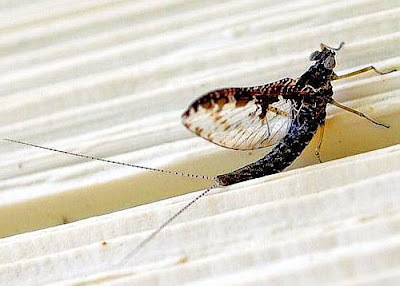 There are Hoppers, Spruce Moths, Beetles, Spiders, Caddis, and several squadrons of mayflies - that we seldom see, except on the windshield - every day. The river has stayed cool, (as it usually does,) and the grass is surprisingly green. 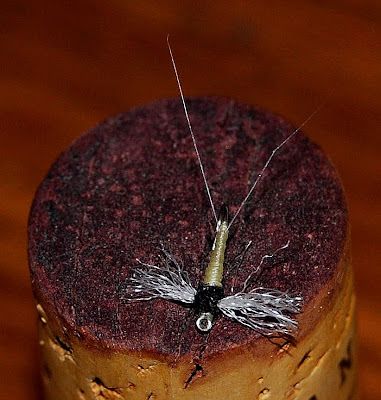 .. We're not going to abandon our practice of fishing flies that we can see with the unaided eye, but we just may fish a few more of these little fellas. The trout can see them and that's what counts. .. We have permission to show you these flies, whatever they may be called. If they have names - use them. The images are large enough, (just click on them,) for a good view - should you care to tie some up yourself. .. The two flies shown below are doing double duty right now. They are favorites for gulper fisher folk on Hebgen Lake. You didn't hear it here! Gibbon Road between Madison & Norris is now closed. .. Auld Lang Syne was generated by Robert Burns: bless the Scot. .. It is a poem that incorporates some wisdom from "an old man, that I knew." Burns added his touch and the Scots carried it with them around the world. .. The original question, loosely translated into contemporary language, is simply: "Should we remember the good old days?" The answer is buried in the poesy. .. We've fished the Gibbon River on and off for over 40 years: nearly weekly these last eight or ten. The sojourns will be missed for the next couple of years. We hope to live long enough to trek down canyon when access is restored. .. Here's some videos that capture the visual flavor of the soon to be abandoned canyon section and it's road. Restoration will be good for both fish and fishers. .. Despite the nay sayer's skepticism, the cool weather has kept the river fishable. 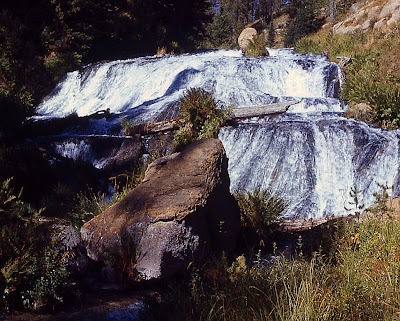 The real warming takes place in the lower meadows, below the falls, where the river slows into looping meanders. It fished very well again this weekend. .. The terrestrials and berries are apparent and plentiful. 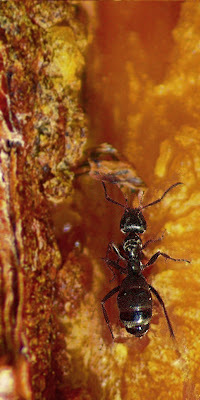 There are lots of ants, a few beetles, spiders galore, and even some grasshoppers. .. 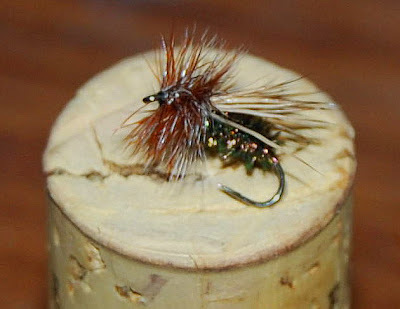 Spruce moths and caddis flies overlap in their activity cycles and a Goddard caddis in two sizes, (10 & 14,) is all that was needed. ..Shid ald akwentans bee firgot, an nivir brocht ti mynd? Shid ald akwentans bee firgot, an ald lang syn? CHORUS: Fir ald lang syn, ma jo, fir ald lang syn, wil tak a cup o kyndnes yet, fir ald lang syn. An sheerly yil bee yur pynt-staup! an sheerly al bee myn! An will tak a cup o kyndnes yet, fir ald lang syn. We twa hay rin aboot the braes, an pood the gowans fyn; Bit weev wandert monae a weery fet, sin ald lang syn. We twa hay pedilt in the burn, fray mornin sun til dyn; But seas between us bred hay roard sin ald lang syn. An thers a han, my trustee feer! an gees a han o thyn! And we’ll tak a richt gude-willie-waucht, fir ald lang syn. So You Want To Live Here ?